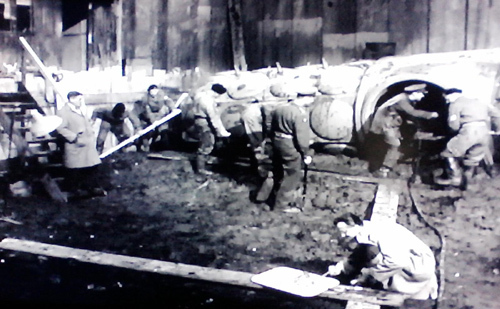 Professor Quatermass tries to scratch the surface with the diamond in his ring and finds it’s harder than diamond. While he’s kneeling down, he observes that there are odd projections on the sides of the hull that he guesses were used to hold external launching components similar to those his own rockets use, and that were ejected in flight. While his Bomb Squad men have been busy digging out the object, Captain Potter has located the records for WWII bombing raids in the neighborhood and finds that nothing bigger than a few incendiaries landed here. Most of the people living in Hobbs Lane had moved out before the construction project began, but one elderly couple a few doors down from the open construction pit remain. The local police are evacuating them now in the face of the bomb threat. Before they go, Captain Potter and Roney’s assistant Barbara Judd catch them to ask what they remember about the local bombings. The Chilcots have been in their home since the first World War; Mrs. Chilcot can remember little “sparklers” incendiaries falling, but no large bombs. What about the house next door? asks Potter, indicating the half-collapsed building between the Chilcots’s home and the construction pit. That looks like it was bomb-damaged. No, says Mrs. Chilcot, that place was abandoned long before the war. The last occupants left it in 1927 and no one has wanted to live in it since–it has a reputation of being haunted. The story was in all the papers at the time. The Bomb Squad, in the meantime, has found an opening in the hull. The hatch is missing and the inside of the object is filled with dirt. They begin to clear this out, and almost immediately pull out another hominid skull, this one intact. Dr. Roney takes charge of this find and carries it into the little shack he’s using as his office to clean it up. As he exalts over the very good condition of this new skull, he starts to say that it must have been protected by being inside the hull… then stops when he realizes the implications. How could such a fragile fossil not have been crushed when that huge thing landed? When Barbara Judd and Capt. Potter return, Quatermass asks them what the elderly couple had to say. Barbara mentions the haunted house, which is practically over the pit site. Colonel Breen has the object and surrounding area scanned with a Geiger Counter and finds signs of radioactivity in the clay–not high levels, but he thinks that everybody ought to leave until it’s been checked out. The Bomb Squad leaves for the night. Before he also departs, Quatermass decides to check out the haunted house, accompanied by a local Bobby who grew up in the neighborhood. The 1927 haunting was before the policeman’s time, but he knows all about it from the stories he heard in his childhood. The people who last lived there reported odd bangs and bumps, and frightening figures seen. He shows Quatermass the kitchen, which was said to be the worst place. (This room, by the way, is the part of the house closest over the pit.) There are deep scratches on the wall like giant claw-marks sweeping downward. As they are about to go, Quatermass thinks he hears something in the kitchen, but there’s nothing to be found when he and the Bobby investigate. Quatermass asks where the old couple went to. The Chilcots are staying with a tea-leaf-reading friend, who is just about to tell their fortunes when Quatermass comes to call. Mrs. Chilcot is happy to tell him about the haunting next door. She says it started around the time the Underground line was being extended (but only mentions this to put a date on the occurrence; she doesn’t make note of the two things as cause and effect). It faded out slowly over time after the neighbors abandoned the house. She claims to have witnessed a few supernatural incidents herself: Tapping and knocking in the floors and walls that “made you feel sick.” Objects moving around by themselves. The parson even came by but his spiritual intervention had no effect on the manifestations. At last, the neighbor said he saw “a figure” and that was that. The newspapers interviewed Mrs. Chilcot about the haunted house but didn’t believe her stories and made her look like a fool. Quatermass seems more sincerely interested and sympathetic. The next morning, he visits Dr. Roney at his office at the Nicklin Institute. Before they get around to discussing the ape-men, the doctor shows Quatermass an experiment of his, something he calls an “optic encephalograph” that’s designed to read people’s brainwaves and show literally what’s on their minds–dreams, hallucinations and visions, memories–but he hasn’t been able to make it work yet. Dr. Roney dismisses Quatermass’s idea that the hominid skeletons found in and around the mysterious object could be from another planet. In spite of their remarkable, advanced brain development, they are obviously of the Earth and fit into the human evolutionary scheme. During this conversation, Colonel Breen phones to say that he’s received a report on the radiation detected on the site. The radiation is at a low enough level that it isn’t dangerous, so they can resume their work, but he calls the rest of the report rubbish and refuses to read it out to Quatermass until the professor insists. According to the report, the radiation isn’t natural but comes from a nuclear-generated source (“man-made,” says Roney, although “man” isn’t exactly the right term). Its half-life indicates that it been decaying for about 5 million years. The Bomb Squad resumes uncovering the object and cleaning out the inside. It obviously looks nothing like any German V-rockets fired during the war, but Breen clings to the idea that it must be a bomb in spite of mounting but incredible evidence to the contrary. Inside the hull, they find that the forward compartment is completely sealed off by a bulkhead. Capt. Potter hoses this so they can get a good look at it while one of his men pumps the accumulated water out of the aft section.